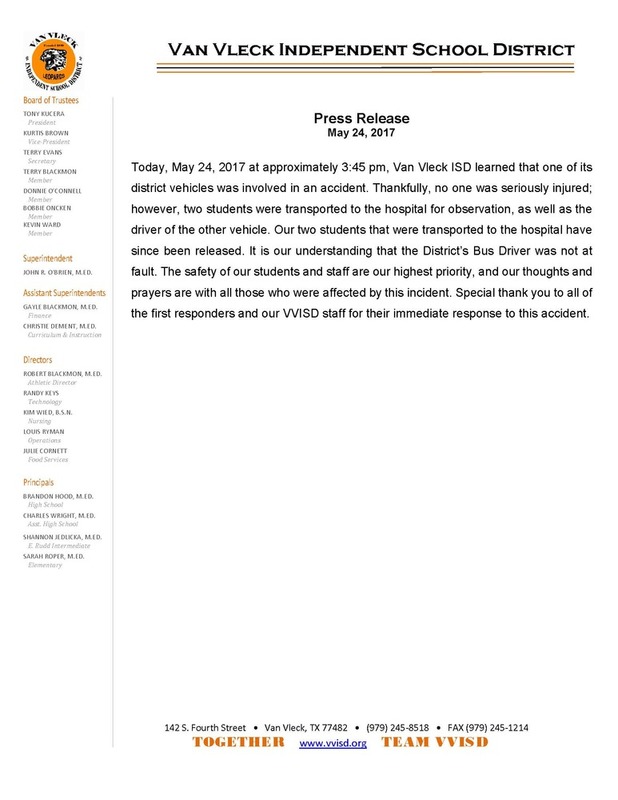 Today, May 24, 2017 at approximately 3:45 pm, Van Vleck ISD learned that one of its district vehicles was involved in an accident. Thankfully, no one was seriously injured; however, two students were transported to the hospital for observation, as well as the driver of the other vehicle. Our two students that were transported to the hospital have since been released. It is our understanding that the District’s bus driver was not at fault. The safety of our students and staff are our highest priority, and our thoughts and prayers are with all those who were affected by this incident. Special thank you to all of the first responders and our VVISD staff for their immediate response to this accident.